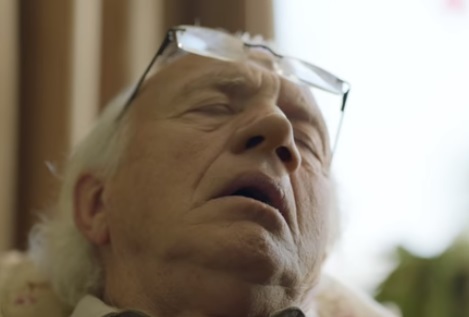 GEICO has released a new ad, featuring a family that can’t believe when their Grandpa’s nose starts performing Flight of the Bumblebee while he is napping. The 30-second spot, titled “Grandpa’s Nose Solo,” opens with a woman (played by Beth Crosby) and her husband (James Zimmerman) sitting on a couch in the living room of his grandparents. “I can’t believe it,” she tells her partner, who’s just as taken aback as her. “That grandpa’s nose is performing Flight of the Bumblebee?” he asks in response. “No, you goof! I can’t believe how easy it was to save hundreds of dollars on my car insurance with GEICO,” she replies as if the old man’s performance is a just some ordinary thing she has seen before. “Nice,” says her husband, who can’t help looking at his grandfather. When touched on the nose by a kid, the grandfather starts playing another tune to the surprise of all those gathered around him. “Believe it! Geico could save you 15% or more on car insurance,” the voiceover says at the end of the commercial. The cast ensemble also includes Diane Mercer as the grandmother, Jack Kersey as the little boy who touches the old man’s nose, and Heather Horton as an aunt. They are the latest names to join a growing roster of actors starring in ads for the insurance company. Casey Campbell also stars as a baseball fan who misses the opportunity to catch a foul ball, Jack Plotnick and Daniele O’Loughlin play a couple who turn their living room into a rain forest to reduce the stress of moving, David Anthony Hinton plays a nervous renter who covers his apartment in packing bubbles to keep everything protected, Daniel Roebuck plays Alexander Graham Bell as he rudely answers his phone in the middle of a show, Darren Richardson portrays the first heckler in recorded history, British actor Max Lloyd-Jones plays a knight teased by Richardson’s character. David Ebert made appearances in several ads, as well as Steve Talley, who played a space captain who lost the keys to his ship just when the galaxy needed him most.